A flash flood warning means flooding is either imminent or already occurring. If you are in the warned area, move to higher ground immediately. 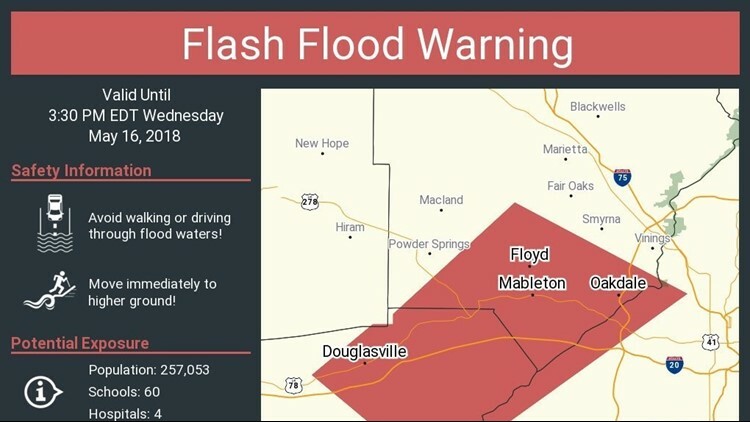 The National Weather Service issued a Flash Flood Warning for parts of Cobb, Douglas and Fulton counties until 3:30 p.m. Wednesday. At 9:28 a.m., Doppler radar and automated rain gauges indicated heavy rain continuing to fall over the warned area. Up to two inches of rain had already fallen and an additional one to two inches of rain were possible within the next one to two hours. Flash flooding was expected to begin in the warned area shortly. A flash flood warning means flooding is either imminent or already occurring. If you are in the warned area, move to higher ground immediately. Residents along streams and creeks should take immediate precautions to protect life and property. A Flood Warning has been issued for Sweetwater Creek near Austell, affecting Cobb and Douglas counties until 9 p.m. Wednesday. At 10 a.m., Wednesday, the stage was 8.9 feet and rising. Flood stage is at 10 feet. The creek is forecast to rise above flood stage and continue to near 10.6 feet by Wednesday afternoon before beginning to fall. It is expected to fall below flood stage by late Wednesday afternoon or early Wednesday evening. At 10 feet, minor flooding begins to occur in the woodlands and fields upstream and downstream from the gauge near the Interstate 20 bridge. Portions of the paintball field downstream of the bridge begin to flood and athletic fields in Woodrow Wilson Park on Mount Vernon Road begin to flood due to water backing up in ditches. Water also begins to flood yards of four elevated homes along Mount Vernon Road in Douglas County. As of 12 noon, officials in Douglas County were reporting road closures on Mount Vernon Road near Woodrow Wilson Park and on Marsh Avenue due to water over the roads. In addition, emergency management officials in Stephens County reported several roads washed out in the Toccoa area. They said up to 70 homes in that area were unreachable as a result to flooded roads.